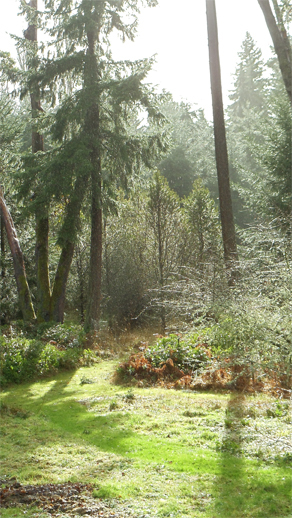 Sun break. © Pat Paquette, 2014. Although we continue to feel the tension of the cardinal configurations in the sky, this week’s Full Moon and planetary aspects are a signature for productive change – if we’re willing to endure some discomfort. OK, maybe a lot of discomfort. Some of the changes may feel out of our control, and they might entail giving up something first in order to clear the way for something better. Even changes that are within our control will require almost superhuman discipline. Fortunately, we will have some cosmic help, with three planets in Capricorn all sending energy to Saturn, ruler of Capricorn and master of commitment and discipline. Moreover, Saturn in Scorpio has no time for whining and procrastinating, especially where finances are concerned. This applies not only to individuals, but to nations. Still, it’s not going to be easy to stick to your guns, and there’s a risk of playing mind games to stay in your comfort zone. We’ll be in the pull of the Full Moon in Cancer for most of the week. Cancer needs its creature comforts and fears the unknown. 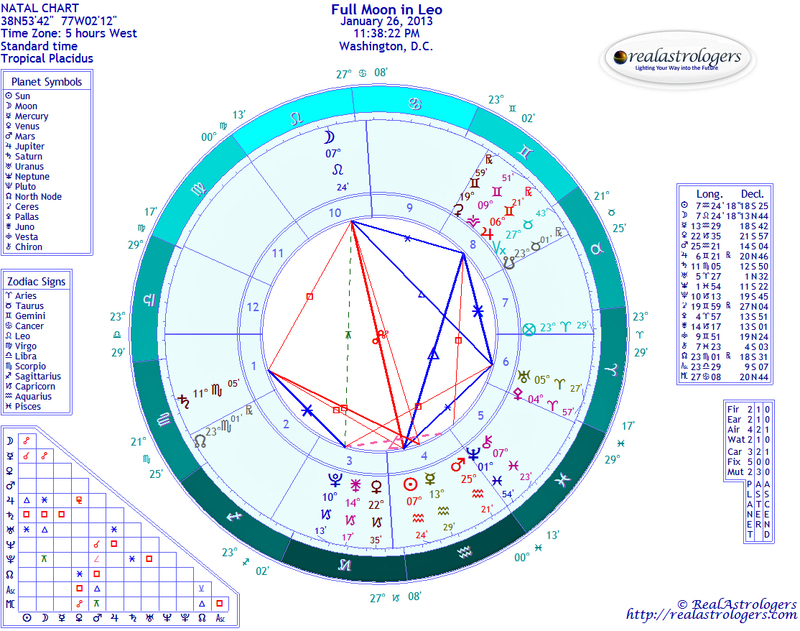 Jupiter also is in Cancer, retrograde, and he’s closing in on a cardinal T-square with Uranus and Pluto. He’s also square Mars and opposite Venus. If what you’re trying to eliminate involves separating from a partner or spending less time with an inconsiderate friend, the urge to go back on your commitment could be hard to resist. Likewise, if the change you’re trying to make involves sticking to a tight budget, you could find it hard to keep your resolve. The Moon reaches peak fullness just short of midnight East Coast time on Wednesday (it will be Thursday in the Eastern Hemisphere). Typically, something begins at the New Moon – a project, a relationship, a new opportunity – and it culminates at the Full Moon, plus or minus a few days. However, the New Moon also can represent an ending, and the New Moon in Capricorn on New Year’s Day had endings written all over it. Think about what might have ended for you two weeks ago or maybe a little before. Or perhaps you knew at the New Moon that you needed to let go of something in your life that was holding you back, but you weren’t quite ready to give it up. In that case, this Full Moon could bring confirmation that eliminating what isn’t working for you is in your best interest. The evidence might come through a specific incident, or perhaps a eureka moment accompanied by a strong feeling that you’re on the right track. The process of clearing away and cleaning out will create a space for something new and better to come into your life at the New Moon in Aquarius on January 30. Likewise, if a door closed for you at the New Moon, a new door may not open until the end of the month. That’s not necessarily a bad thing. You’ll have an opportunity to slow down and get back in tune with your feelings. You might find that you feel differently about a change than you did two weeks ago. If you didn’t react back then, or if you had to keep your emotions under wraps due to circumstances, now you’ll get a chance to release pent-up emotional energy. It’s not always a comfortable place to be, but emotional release is necessary. Give yourself permission to give in without judgment. There are no “negative” feelings. Even anger has its place, and it’s one of the feelings we most often suppress. It’s just hard to find an appropriate way to release it without hurting someone, including yourself – like the time in my late 20s when I kicked a wall, forgetting that I was wearing sandals. A vigorous workout is the best way to blow off steam. Housecleaning is good, too. Now, it is entirely possible that something did begin for you at the New Moon, in which case you should start seeing results in the coming week. Depending on where the New Moon fell in your chart, that “something” might have been tangible, maybe a new job or relationship. Or it could have been less visible, like a change in a belief that’s been tripping you up, perhaps a shift toward more positive self-esteem. Even when something good happens, we can feel an overflow of emotions. For example, someone who finds a new job after a long period of unemployment might be so overwhelmed with relief that they need a good cry. Cancer represents family and the comforts of home, while Capricorn is usually associated with career and ambition. But we tend to forget that Capricorn is a feminine sign. Half goat, half fish, the mythical sea goat can scale the highest mountains and dive to the depths of the ocean. In some ancient cultures, mountains were associated with powerful goddesses. The sea, from which life on earth sprang, is associated with Cancer, the sign of mother, the womb, and birth. We think of Saturn-ruled Capricorn as father to Cancer’s mother, but it’s also the family matriarch, the grandmother who has seen and done it all and provides wise guidance to successive generations. The cardinal signs – Aries, Cancer, Libra, and Capricorn – represent initiating energy, and all four will be active for several months. That’s why astrologers are predicting so much change. And yet, this Full Moon has an enduring quality to it, telling me that the changes we’re seeing may be new and even a little scary, but they are part of a larger cycle. Dwarf planet Ceres is in Libra and square the Full Moon by less than half a degree. I’m still observing how Ceres functions in individual and mundane charts, but her mythology suggests something to do with cycles, like the changing seasons and life cycles of plants and animals. With our technology oriented lifestyle, we often lose touch with these natural cycles and, as a result, feel separated from nature. A continuing “outlet” for tense cardinal energies to flow is the easy sextile from Pluto to Chiron in Pisces, which represents deep healing in our individual and collective psyches. The root for “healing” is the same as for “whole.” To be whole, we have to feel a connection with the oneness of the universe. A second outlet at this Full Moon is the sextile from Mercury in Aquarius to Uranus in Aries on Friday (late Thursday in western time zones). Mercury and Uranus both represent the intellectual workings of the mind, and Mercury in Aquarius has some of the same spark of genius associated with Uranus, ruler of Aquarius in modern astrology. The sextile is dynamic and conducive to the firing of neurons. Pay attention to sudden flashes of brilliance. There’s a possibility of coming up with innovate and unconventional solutions to perennial problems. 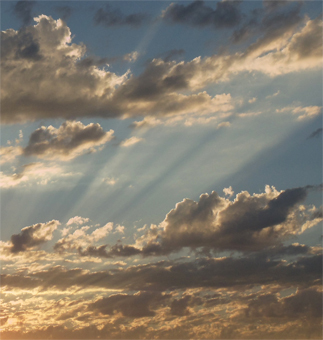 Late Sunday (in the United States), the Sun leaves staid Capricorn and enters quirky Aquarius. The eleventh sign of the zodiac is future-oriented, scientifically pioneering, unconventional, and humanistic – although it’s also a fixed sign and can stubbornly resist change, especially in its thinking. Just one of its quirky inconsistencies. Still, I think it’s a good combination with the cardinal energies, as it represents higher ideals at a time when there’s so much momentum worldwide for change. What do we want to become? What kind of future do we see for ourselves as a group, a nation, a species? Next week we get another short breather, so if this week gets too emotional, relief will be on the way. This entry was posted in Forecasts and tagged Aquarius, cardinal T-square, Full Moon in Cancer, Jupiter in Cancer, Uranus-Pluto square on January 12, 2014 by Pat. Young Woman with a Pitcher, by Dutch painter Johannes Vermeer, 1660-1662. The painting represented a shift in how the artist used light. 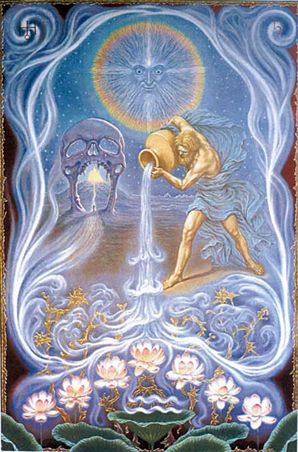 The symbology of Aquarius as the water carrier belies the higher purpose of Aquarius to flow the dual waters of love and life for thirsty humanity, like a divine fountain or wellspring. Aquarius’s role within this one body of humanity is to provide this constant source of divine energy, through the fusion of heart and mind. This is why conventionally in astrology, even though Leo rules the heart, it is Aquarius that rules the circulation and flow of blood. Esoterically, Aquarius governs the distribution of the vital waters of love and life throughout both the individual human body and the larger body of humanity! In the first article in this series, we looked at Patanjali’s description of consciousness in terms of five “bodies” or dimensions of experience: physical, energy, mental, intuitive, bliss and, ultimately, universal mind. It seems that Uranus and Jupiter in Aquarius combine to create those conditions necessary for us to experience and transcend the intuitive and bliss dimensions on our journey to universal mind. The soul experience in Aquarius can be likened to a collective awakening, which we will have more experiential knowledge of as we reach the culmination of the Aquarian Age. As a result of the conditioning effects of Uranus and Jupiter, there is a flowering of human consciousness. We may think of it as a collective awakening, yet it is more akin to an awareness of our individual roles within the universal mind. Here there is a hint at the role of the Moon at hierarchical level in this mass awakening of humanity. The experience of universal mind is the higher group consciousness of Aquarius and is nothing like our current mental-intellectual experience. Rather, it is a level of higher mind that is born within from the fusion of higher mind (intuition) and heart-wisdom. If an egg is broken by an outside force life ends. Your vital life-force energy comes from within. While it is natural for Aquarius to circulate (Aquarians are amazing networkers) it is more important that you pay attention to how you are flowing your energy. A fully integrated Aquarius will have accessed the heart-energy of their opposite sign Leo and be flowing vital heart-mind energy through an open heart. The Aquarian who is not yet fully attuned to their heart may just be circulating mental information at best and misinformation at worst. If you have Sun, Moon and especially Rising Sign in Aquarius, a major theme in your life is the circulation of life-force energy in the form of heart-wisdom. Be sure to access the inner dimensions of your own heart first to discover the inner fountain of life force energy and heart-wisdom, so you can then flow this energy with conscious intent for the benefit of humanity. This entry was posted in Guest Posts and tagged Age of Aquarius, Alice Bailey, Aquarius, Esoteric Astrology, soul astrology on February 9, 2013 by Pat. Aquarius Season is upon us once again, bringing with it an opportunity to check in where we are up to in dedicating our personal energy to the body of humanity. The sign of Aquarius is associated with individuality, uniqueness, science, technology, the future, humanitarianism, the New Age and group consciousness. According to Esoteric Astrology, the last four signs of the zodiac – Sagittarius, Capricorn, Aquarius and Pisces – are signs of service. Following the soul’s journey through the 12 signs of the zodiac, after the soul in Capricorn has followed and completed the path of light, leading to Christ consciousness, it is time for the soul in Aquarius to become the world server, flowing love and life for the benefit of thirsty humanity. Four planets are important in creating the conditions necessary for the soul’s development and experience in Aquarius: Saturn, Uranus, Jupiter, and the Moon. Saturn was traditionally considered to be the planetary ruler of Aquarius, and to many people still will be. The conditions that we mentioned in last month’s article pertaining to Saturn and Capricorn also relate to Aquarius when humanity is largely personality centered and driven by fear and attachment. Once the soul has completed the stage of development in Capricorn and has accessed Christ consciousness, it no longer is limited by the constraints of Saturn and comes under the custodianship (planetary rulership) of Uranus. As humanity increasingly moves onto the fixed cross (see last month’s article for an overview of the evolution of consciousness in terms of the three crosses), where there is awareness of soul and personality, Uranus increasingly becomes the custodian of Aquarius at personality level. Jupiter is the custodian of Aquarius at soul level, while interestingly the Moon is the custodian at hierarchical level. Since we already explored Saturn in last month’s article on Capricorn – and the effect would be the same here in Aquarius until the individual consciousness has become receptive to the energies of Uranus – for our purposes in this article we will focus on the two major influences for this early phase of the Aquarian Age, Uranus and Jupiter. The subtle influence of Uranus begins in Aries at hierarchical level, continues working through Libra at soul level, and here in Aquarius, human consciousness has evolved to the degree that the subtle energies of Uranus can be received at personality level so the individual can perceive and fully utilize the intuitive faculty. Although even talking about “perceiving” and “utilizing” is misleading, because it sounds like there is something distinct and separate outside of ourselves to be perceived and utilized, which is not the case. By the time we have a conscious soul in Aquarius, we have gone beyond duality, and the experience of the intuitive faculty is that of embodiment. We realize it is who we are. We are aware of ourselves. This is also why Jupiter is the custodian at soul level in Aquarius, because we are experiencing our most expanded and expansive nature (without self). The soul in Aquarius becomes the world server, and the highest soul purpose of Aquarius is the dedication of personal energy to the collective. Once again, even the term “collective” could be misleading, because our common understanding of collective is separate individuals forming a group. Yet, the highest soul experience in Aquarius is not one of separation, but of each individual being part of the whole body of humanity. Humanity is experienced as one, with each individual being an integral part, just like the cells within a human body that are individual yet indivisible from the whole. Since there is no experience of a separate self, there is no question of harming “others,” as to do so would be tantamount to chopping off one’s own fingers or toes! Others do not exist as such and all that is experienced is we, as one. In Part II, we’ll look at the connection between Aquarius and the collective awakening of humanity. *I don’t believe this refers to modern Freemasonry, which the Tibetan describes as a “distortion,” but rather is a simple metaphor for one who is a Master in their respective field. 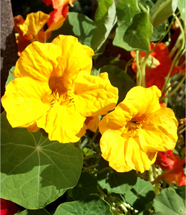 This entry was posted in Guest Posts and tagged Age of Aquarius, Alice Bailey, Aquarius, soul astrology on February 6, 2013 by Pat. As we begin this week, all eyes are on Washington, with three quarters of a million people expected to attend the inauguration of President Barack Obama. It’s a fitting start to a week that will end in the Full Moon in Leo, the sign of rulers. Now, I’m sensitive to the fact that many of you aren’t in the United States – at last count, RealAstrologers had readers in 180 countries – and while I don’t believe the world turns on everything we do here, it’s hard not to be influenced by one’s culture. Still, I think it’s fair to say that this is one time when activities in Washington really are of global importance. Over the past week, I’ve been looking at charts for another potential leader, one not even born yet. That would be the first child of Prince William and the former Kate Middleton, whose due date has been revised to July. Palace officials were forced to announce her pregnancy prematurely in early December, because she had to be hospitalized for a rare form of “morning sickness” (technically, it’s not, but that’s how it has been reported). At the time, they said she was 12 weeks pregnant. Of course, I did a quick look at the charts to see if that would put her due date around the time of the grand water trine in July. It didn’t, and so I forgot about it. But then it was announced last week that her due date in fact is in July. I just had to do a video, and fortunately, I was able to knock it out in a few days – I’m getting faster with experience. Beyond that, I’m a big fan of Kate’s, not because I care about what she wears or how she cuts her hair, but because of the way she has stepped up to the plate to accept her destiny, with more grace and class than most of us would be able to muster. Sure, she gets the best of anything money can buy. But can you imagine being on a international diplomatic tour, with every twitch of your little finger under a microscope, while tabloids were splashing photos of your naked breasts all over the front page? Well, OK, I suppose there are people who get off on that sort of thing. I’d be mortified. On top of that, she’s been on baby watch since the wedding (if not before), as though she were a brood mare. Anyway, those of you who like to analyze birth charts will have a lot of fun with this video, which shows some fascinating family patterns. Incidentally, these patterns often show up in families. My own is no exception. I’m an Aquarius with Moon in Pisces. My father was an Aquarius, and my mother was a Pisces with Moon and Venus in Aquarius. Both older siblings were Aquarius and Pisces. 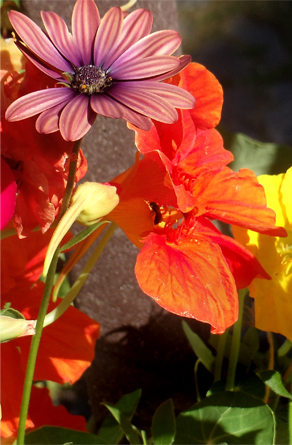 Mercury makes positive aspects to Uranus and Jupiter on Tuesday, stimulating creative thought and big, bold ideas. If you get a legitimate opportunity to turn them into reality, jump on it. The key word here is “legitimate,” and it may be hard for you to determine whether or not you’re onto something big. There’s a lot of impulsiveness in this combination. If you can buy time to sleep on any offers, do it. If you can’t, talk to a friend or someone you trust to give you a reality check. These same two aspects are repeated by the Sun on Thursday and Friday, so it’s quite possible that if you decide to sleep on the deal of the century and lose out, you’ll get another chance. In fact, any opportunities should stay open right up to the Full Moon on Saturday. 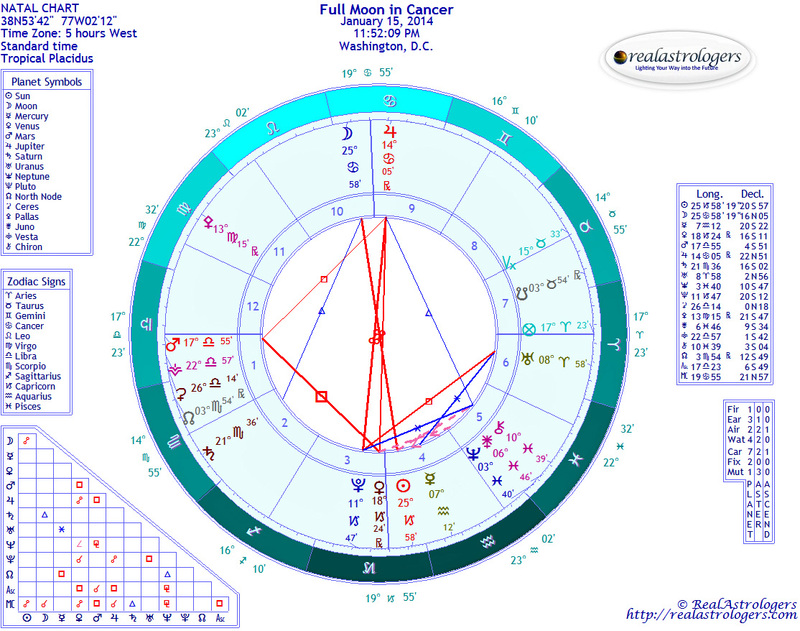 The chart for this Full Moon looks a little scary, with the Sun and Moon forming a fixed T-square with Saturn (Mercury squares Saturn on Friday). Obstacles can seem insurmountable, and that can be depressing. However, I’m going to go with a more optimistic read on this Full Moon, thanks to the aforementioned positive aspects. Indeed, the square with Saturn could be just the sobering influence we need to bring pie-in-the-sky plans down to earth, where they actually could be turned into a profitable venture with some careful thought and hard work. Jupiter is stationed, about to turn direct on January 30, making it even more likely that we can get our big projects off the ground. As you know, I take a cautious approach to asteroids in the chart, since I believe we’re still in an experimental stage regarding how these energies work. But I can’t help think that the close conjunction between Uranus and Pallas is significant. The most intriguing interpretation I’ve seen of Pallas to date comes from Christina of the Oxford Astrologer, who assigns to her an ability to recognize patterns. As she notes, this is particularly important in astrology. Astrology is all about recognizing patterns in order to use planetary energies to further our goals and fulfill our highest potential. Be receptive to new ideas this week, but also start preparing for Jupiter’s return direct. 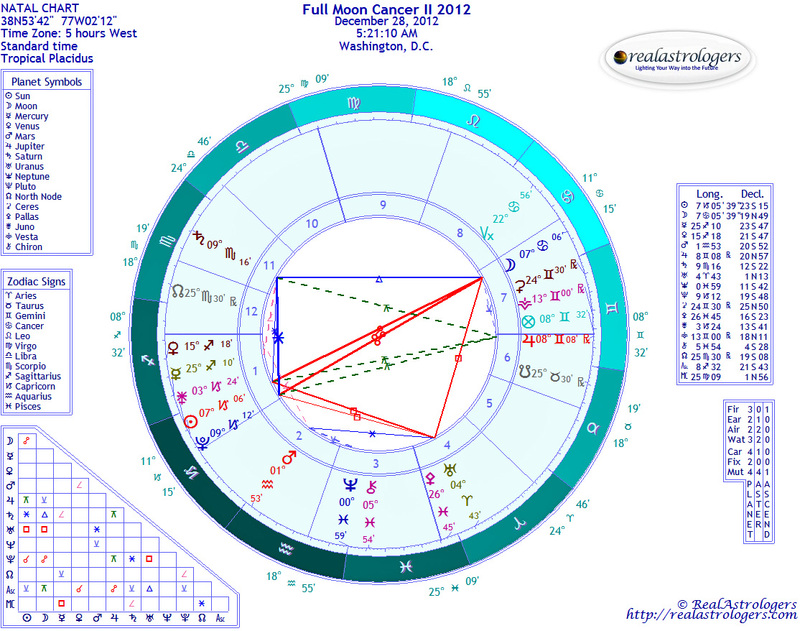 Look at where he’s transiting your natal chart for an idea of where you’ll get the most help in advancing a cause. I started putting out feelers about a week ago, with some interesting results starting to come in. 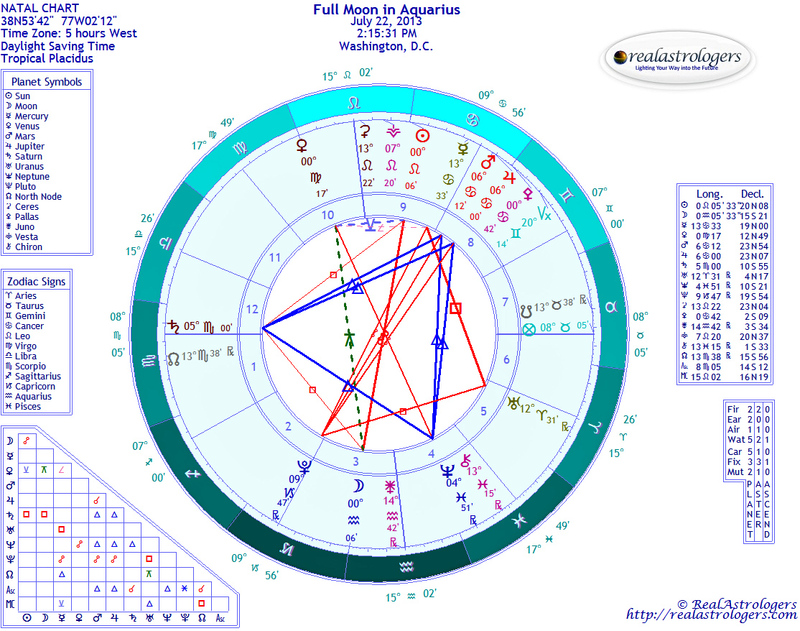 This entry was posted in Forecasts, Full Moon and tagged Aquarius, full moon, Jupiter retrograde, Leo, RA-TV, Sun-Saturn square on January 20, 2013 by Pat.